The undercover shoplifting operation was conducted on Thursday, April 4, at the west Lancaster Walmart at 44665 Valley Central Way. LANCASTER – A boy’s Mongoose bicycle, food, cosmetic products, and pet products were among the stolen items recovered when undercover deputies and Walmart Loss Prevention Agents monitored customers as they shopped at the west Lancaster Walmart last Thursday (April 4). During the shoplifting operation, deputies arrested six adults and four juveniles for various charges, including commercial burglary, robbery, and possession of a controlled substance. Amber Leyette Lopez, 22, of Lancaster, arrested for burglary. Quitari Shante Mabins, 26, of Lancaster, arrested for burglary. Jessica Ashaunte Kelley, 28, of Lancaster, arrested for burglary. Dorcell Cortez Coner, 19, of Lancaster, arrested for burglary. Chardonnay Chandler, 28, of Lancaster, arrested for possession of a controlled substance. One Black juvenile male from Lancaster, arrested for robbery. One Black juvenile male of Lancaster, arrested for burglary. One Hispanic juvenile male of Lancaster, arrested for burglary. One White juvenile male of Lancaster, arrested for burglary. Deputies from the Lancaster Station Target Oriented Policing Team and Community Oriented Response and Enforcement Team (TOP/CORE) conducted the undercover shoplifting operation. The TOP/CORE Team routinely conducts these types of randomly scheduled operations at the request of local businesses. 35 comments for "Shoplifting sting at Walmart nets 9 arrests"
I SAY HAVE THEM WEAR SIGNS IN FRONT OF THE STORE TELLING THE PUBLIC THEY GOT CAUGHT STEALING! MOST OF THEM ARE LEFT TO GO FREE WITH A SLAP IN THE HAND BY A JUDGE TELLING THEM NOT TO DO IT AGAIN!! MOST OF THEM WILL NEVER LEARN AN WILL CONTINUE TO COMMIT MORE CRIMES!!!! Hold the children until their parents take them out, then fine the parents. If these operations are at the request of local businesses where are the stats for stores other than Walmart. Seems to me that Walmart is getting favored over others. Is this a case of Rex protecting his cash cows. Just because Walmart and Vose Properties and Stanley Rothbart donated $16.5 grand to Rex in his run for mayor doesn’t mean he would favor them by putting a Walmart that the residents overwhelmingly did not wantnext to a high school or offer Walmart added protection. There is no favortism here. Get real, Anti-REX. So if Walmart has its own store security then why do we have to pay for members of the sheriffs dept to run a sting operation. How much does this cost us. And from what some people tell me that walmart is so under stocked lately that there’s not much worth stealing anyway. Scott, this is our new reality. We are the Walmart capital of the world. It will grow. Did not you hear our Mayor explain what happened? He was forced by the mayor of Palmdale to put the Walmart in. He had no choice. When you put a Walmart in next to a high school you will have an increase in crime. So he has to provide security to make Lancaster the safest city in America. Putting extra security in at taxpayer expense is par for the course. Do not get angry at the mayor of Lancaster. No. This is all on account of the mayor of Palmdale. Rex had to do it. He had no choice. He is powerless against the mayor of Palmdale. Well for one it was a bold face lie on Rex’s part. 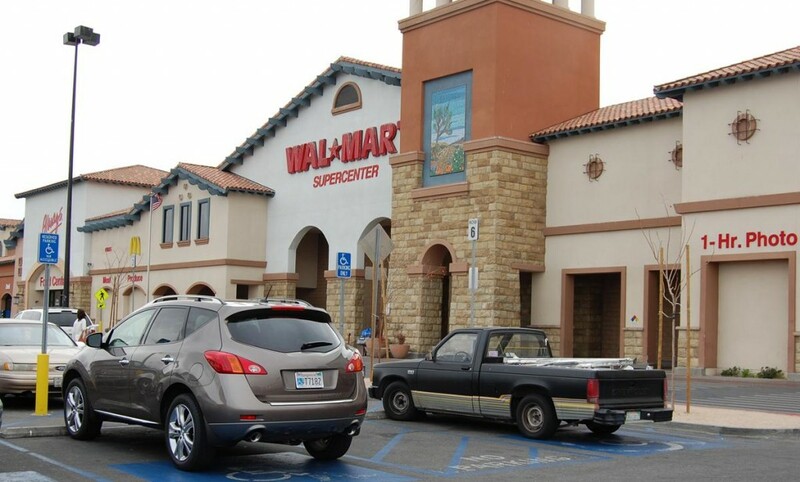 Palmdale was never in the picture as for a location for walmart. as for why it is being built in near quartz hill just look at the properties that were sold for the project and who owned them. I bet the usual suspects are involved, plus Rex got a handsome amount donated to his war chest campaign fund by walmart for his election. I am familar with the Walmart mentioned. I notice that pet supplies, cosmetics, and bike were taken. The items mentioned are near the exit through the Garden Dept. Last time I visited the store, this exit was not monitored as it used to be. I know it is humilating to have to show your receipt on the way out, but I don’t mind if it stops the shoplifting. Agree Mike. Both the North Auto Parts door and Garden Center door are places where people walk out the door without checks. Costco checks receipts EVERYTIME I exit their store and I don’t find that humiliating at all.It needs to be done. Can you imagine the theft that will happenwith the new Self Check registers at the Valley Central Walmart grocery department. I usually shop at Albertsons, and always use the self checkout. I see people who put 3 things in their bag for every 1 they check. I am sick of being frisked when i walk out of a store! I pay my bill and my taxes. String up the hoodlums and stop treating the honest people like they are trying to steal something. You’re morning frisked. And I can assure you, your receipt is not being checked EVERY TIME you leave the store. Half the tone the greeter is not there, or sitting on the bench at McDonald’s. AND honest people steal as well. Then they lose that title. I never show my receipt when asked to do so at Wallyworld. I just say “No thank you” and keep on walking. If they persist, they can deal with section 207, 236 and 237 of the California Penal Code when I turn the tables on them. On the other hand, Costco is a private membership store. I show my receipt everytime I leave as I have agreed to do so as part of my membership. @cynical i like how you think! I was in the store today Saturday and a checker or ‘greeter’ has been stationed again at the exit by the garden dept. Okay with me. I save plenty at Walmart and I don’t want the store to go under or people to lose their jobs because of shoplifting. its funny how people care about a multi billion dollar corrupt corporation and the fact that they mention the race of the suspects is just classic. Good job AV press on keeping stereotypes alive and being another source of news that attributes to racial stigmatism. It’s not concern for the corporation, but concern that thieves are out and about in the community. You and those listed have no regard for the law and for whatever twisted irrational reason you feel more entitled than people who pay for their goods. As far as your assertion that the AV Times is perpetuating stereotypes, that is ridiculous. They are reporting the information that is provided. If you are worried about people perpetuating stereotypes, look towards the people who reflect those stereotypes. Did it ever occur to you that people in Lancaster and Palmdale value having crime free, safe shopping experiences without paying high prices because scum want to shoplift? As far as the AV Times posting the race of the shoplifters, then quit shoplifting! Quit expecting people to cover up for you when you commit crime! I take it that you are embarassed by what is being reported. But you aren’t embarassed by using a name like “LOCAL SHOPLIFTER”???? If you don’t like being embarassed then you have got some work to do in your community! You need to tell people in your community to be honest and stop shoplifting and they wouldn’t be stigmatized for it. Multimillion Dollar Corporation or not, Walmart provides lots of jobs to people who are thankful for their paychecks and the opportunity to provide for their families. The wages may not be the best, but they are working and not out shoplifting. They are not taking advantage of a social service system that seems to cater to the lazy people who spend all day trying to scam and steal from society and everyone else. Fraud is a big problem…I suppose if the stats for who is getting multiple sources of aid from social services was available, that would be profiling too? If the shoe fits, wear it! I am in favor of posting mug shots. Unfortuatly many of the shoplifters are not taken into custody. They are given tickets and a date to appear. And they usually fail to appear….surprise. I don’t see and race hating in the post.. It said black,white and mexicans got caught! It just happen that on that day most of the ppl who stole ate black..
Community out reach and educate the ppl shoplifting!! If you think it’s a problem… I criminal is what it is no matter what race!! I hope Walmart gets fined by the City of Lancaster if they fail to prosecute these thieves. Pictures of the adults should be posted if possible, many people are not afraid of being arrested but everyone hates being embarrassed. Remember the last D.U.I. checkpoint story? Somebody would scream that their civil rights are being violated. Many other states post mugshots on the jail websites. I agree with you on posting their pictures. But I think we should start posting the names and faces of the juveniles also. They want to act like adults and commit crimes then they should be treated like adults. No more sealing their records, let them live with it the rest of their lives. No more excuses. Really, ‘Sig Sauer?’ Let every little mistake that a person makes be held against them forever… Right? After all, you’re so perfect yourself, aren’t you? Stinger maybe some public humiliation might do they some good. My sister got caught and got marched through the mall in handcuffs. Did she ever do it again? Nope, she said she learned her lesson and never wanted to feel like that again. Instead of coddling them, make their names and crimes known. Hopefully stop future crimes from being committed. These kids know no consequences of their actions today. I agree Jason, post names and photos. mugshots of Av’s finest. Screw their rights, by all RIGHTS the manager should be able to beat the [removed] out of them in the aisle they stole from. By all RIGHTS, as a shop Keeper I should be able to see who these pieces of trash look like. They have the right to an attorney paid by my [removed] taxes for [removed] they stole “cause I had to ” , isn’t that proof of their rights? Try that stuff in another country and see what happens to you’re rights when the locals break you’re hands and ankles with cinder blocks. “Boo-deleted-hoo” my rights. Stinger, the problem is there is no retribution anymore for these kids. From the judicial system and in most part from parents. Most of these kids know that all their going to get is a slap on the wrist. I know when I was growing up, just the thought of a whoopin from my dad kept me out of trouble. And know I don’t think I’m perfect. But it does piss me off to see these kids get away with something, that cost’s the consumer’s including you higher prices for products in the stores. I’m fine with that aspect of your posting. I have a problem with your suggestion of trying to pigeonhole every person with every mistake they have ever made for their entire life. Exposing a kid to some ridicule is not going to scar him or ruin his “good name” for life. It might however, make that kid think twice before he does it again. Some early intervention in the form of punishment for crimes when they are caught might deter them from a life of crime. I agree… This would provide business owners with a “heads-up” about people who enter their stores that have a history of shoplifting.